Today marks the 4th week of Advent. We light the last purple candle that symbolizes LOVE. In this Fourth Week of Advent, our final days of preparation before Christmas, we ask Christ to forgive us for our sins and, through His grace, to create us anew when He comes. 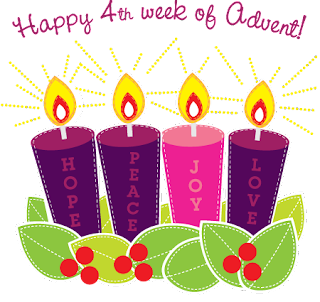 This week is also a time to recollect, to reflect on our Advent journey. If we have let the hustle and bustle of the season get in the way of our spiritual preparations for Christmas, we have one last chance to refocus—and the light of the candles on the Advent wreath can be a symbol of our focus, as well as a symbol of the light of Christ. Lord, hurry and come to us. May your light shine in our lives, so that we may be freed from sin. Protect us from all anxiety as we wait in joyful hope for your coming as our savior: For the kingdom, the power and glory are yours now and forever. Amen.